I usually beat around the bush quite a bit and that’s on purpose. I spent several decades turning my newspaper/magazine copy in to various species of flesh-eating editors who summarily stripped it of anything other than its bare and bloody bones. Escaping that strait-jacket of uniformity and writing The Pour Fool is a relief akin to that seen from a fat guy who’s just been handed a quart of ice cream after three days in Death Valley. 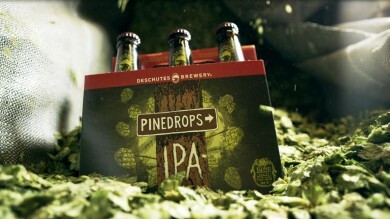 Deschutes “Pinedrops” IPA is THE single, absolute, no-foolin’ best new idea in IPA that I’ve tasted…ever. Let’s get past that old crap about my status as Deschutes #1 fanboy, right now. This beer could have been mailed to me anonymously, in a naked brown bottle, and I’d be saying the same thing. Pinedrops is so shockingly different, so utterly creative and near-perfect in its conception, that it had me groping for words for literal days afterwards. That’s exactly why this review is about five – six days late in landing here. The first salient fact is that it derives its haunting woodsy, piney aromas and flavors from a combination of Nugget, Northern Brewer, Chinook, Centennial, and Equinox hops and a caramel-tinged, silken malt bill (Pilsner, Pale, Carapils, Munich, and Crystal) that lends a totally seductive character to this beer; something which recalls a dark Belgian Dubbel or maybe a Scotch ale. It shows a wicked little touch of sweetness that would seem a little counter-intuitive when suggested as a complement to big resins but actually heightens the pine/spruce intensity while giving it an almost addictive drinkability. I rarely ever have more than one beer – for drinking purposes, as opposed to the standard 1 oz. taster – in an evening but I had a brutal and barely-controllable yen to just demolish all three bottles of this stuff. I get that urge maybe once in every 300 beers I taste (the latest before Pinedrops being Fort George’s epic “The Optimist”) and having experienced it twice in one month is a real Event and completely validates my firm resolution to drink a pint or bottle of beer ONLY when it’s so great that I can’t help it. My views on the whole notion of “session beers” are well known and don’t bear repeating here, except to say that, if anybody ever makes a sub-5% beer that stands up as a beverage like Pinedrops or The Optimist, THAT is when “sessioning” will begin to make sense to me. It’s very hard to write adequate tasting notes for this Pinedrops because it is not only complex but, as approachable as it is, laying on reams of flavor descriptors kinda blunts the point of this ale. 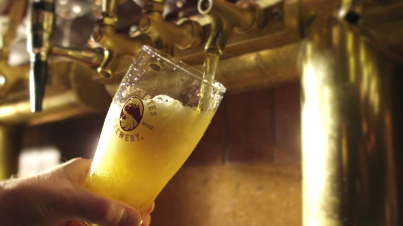 Nobody really needs a shred of beer knowledge or refined erudition to appreciate it and various beer novices have told me that they’re intimidated by the whole notion of complexity. Don’t be. “Complexity“, in most beverages, just adds up to “interesting and vibrant“; a lively impression in your mouth and that desire to have another. It does NOT mean that you have some obligation to sit and dissect what you’re drinking like it was a med lab cadaver. But Pinedrops does provide just as much enjoyment and interest for us beer wonks as it will for the casual drinker who just wants a delicious beer with some hair on its chest. The flavors include a big, warm, slightly spicy wallop of creamy caramels and apple butter, right up front, with that boozy treacle flavor that recalls the faint aftertaste of whiskey, even though this ale has never seen the inside of a barrel. Citrus pokes through everywhere, from the tangerine and lemon zest on the front of palate to blood orange in the mid-palate, to lime leaf and pomelo on the lazy finish. All of this is the background chorus to a deluge of pine and spruce resins that range from sweet herbs to a suggestion of jasmine to those wild citrus notes. This is an EXTRAORDINARY beer; literally without a valid comparison to any other IPA currently on the American market, at least among the thousands I’ve now tasted. The hoardes of young HopHead loonies may find it too tame but then it’s really not aimed at them. Pinedrops sits firmly at the front of a whole new wave of What’s Next for our US IPAs: drinkability, refreshment, balance, structure, and intelligent concept. The days of the mega-ton, test-of-manhood IPA nonsense are coming rapidly to an end and it cannot happen too soon. Ales like this are what’s going to bring in the next wave of smart, savvy craft beer fans and this will be very much the shape of the future of this style of beer. The signpost on the label is a totally apt piece of marketing: IPAs went thataway -> and smart beer fans will follow the Signs. I don’t usually even concern myself with who it is at Deschutes who conceives and crafts even their most brilliant beers but this time, I’m hoping somebody reading in Bend this will email me and tell me whose idea this was. 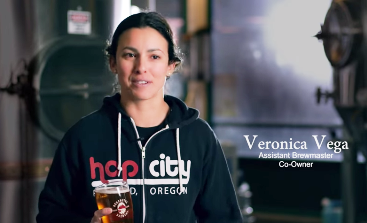 (I suspect America’s leading Beer Munchkin, the brilliant assistant brewmaster Veronica Vega had a big hand in it. It just sorta carries her attitude.) That person deserves both a raise and a full-frontal curtain call.